BRING THE HORSES! You won't believe this over 6,000 sq.ft. custom ranch-style home on 10 lush, beautiful acres. 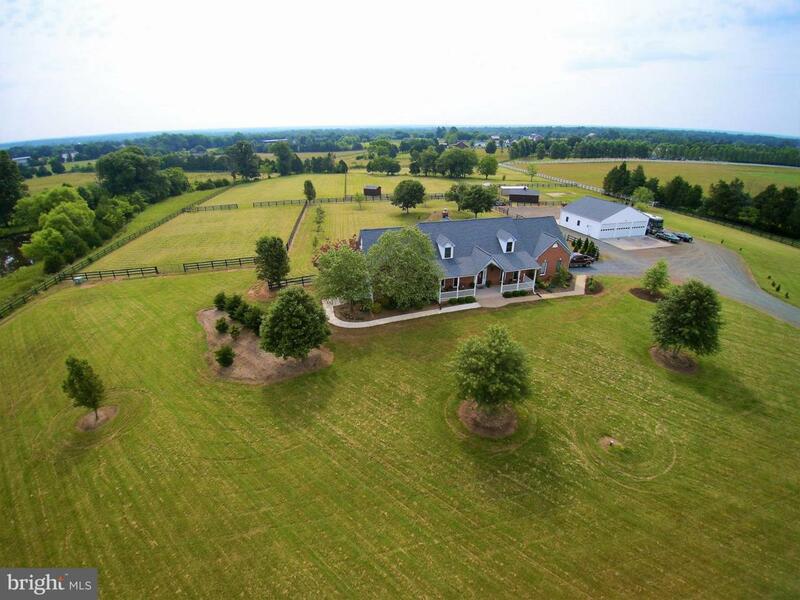 3 paddocks, fencing, riding ring, 40x40 FIVE car pull-through gargage w/dual fuel HVAC & half bath. CAR ENTHUSIASTS or small business entrepreneurs will love the detached garage flexibility. Have a motor home? Garage accommodates that with 14 foot door & pump out station.The house features a huge main level master bedroom complete with dual walk-in closets and attached bath. Master bath has two person jetted tub, dual vanities and large shower. Super-sized kitchen has all the amenities, like granite counters, gas cooking, two wall ovens, tons of cabinet space AND two pantries. The breakfast nook offers glorious views. Attached is the informal living space with cathedral ceiling and fireplace. Third bedroom customized with glass French doors and secondary bath with roll-in shower & step-in tub is perfect for handicap accessibility. Laundry day is a joy with a large space and built-in cabinets. All main level flooring either hardwood or ceramic tile. Off the laundry is a powder room and service door to the over-sized attached garage.Upstairs includes teen or guest suite with separate bath. Finished basement has a HUGE party sized rec room, with wet bar, full bath and additional storage. Walk-up stairs to grade on side of house.